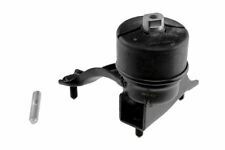 These engine mounts will allow you to bolt the Lexus/Toyota UZ series V8 engines into E36/E46 BMW's. May fit other models that use similar engines. If you intend to collect the item from us we would also accept cash on collection. Lexus - GS - JZS160_, UZS161_, UZS160_ [1997-2004] Saloon - 4293ccm 283HP 208KW (Petrol). Lexus - GS - JZS160_, UZS161_, UZS160_ [1997-2004] Saloon - 2997ccm 219HP 161KW (Petrol). 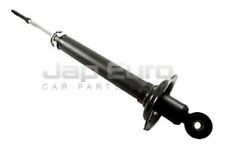 REAR SHOCK ABSORBER (JE09912) - QTY:1. The following product is suitable for: Lexus IS200 JXE10 (1G-FE). Part Number: TOY500M. They also do not suffer from the problem of the engine sitting too high which can happen with OEM style mounts made in harder rubber. Diff Mount front Bush TOY130M. (Quantity 2). These mounts fit directly to the front mounting points on the differential casing. It gives all the benefits of reducing axle tramp but without the drawbacks of solid mounting. Make: Lexus. Add to Favourites. Need your item within 24 hours?. We will always try to find your sale but if we have no information it's like finding a needle in a haystack! 12 Months / 1 Year Warranty. The competition mounts also eliminate clearance problems with strut braces and exhaust systems, body panels etc. and improve handling whist still giving vibration isolation at high engine speeds. Replaces OEM part number:-. The following product is suitable for the: Lexus SC300. 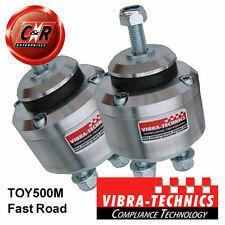 They improve handling whilst still giving vibration isolation at high engine speeds. - Engine Mount TOY120M. (Quantity 2) OEM Part Number(s): 12361-42050 12360-46020. PART FITS TO - LEXUS IS200 1999-2005 MODEL - FROM VERY LOW MILEAGE LEXUS IS200. ENGINE MOUNT - WILL FIT ALL MODELS LEXUS IS200 S SE SPORT. MANUAL AND AUTO. THIS IS GENUINE LEXUS / TOYOTA PARTS. Make: Lexus. Picture is for reference only and shows precise item. Need your item within 24 hours?. Add to Favourites. We are happy to help you with this process. We will always try to find your sale but if we have no information it's like finding a needle in a haystack! The following product is suitable for the: Lexus Soarer Mk3. - Diff Mount front Bush TOY130M. (Quantity 2). These mounts fit directly to the front mounting points on the differential casing. It gives all the benefits of reducing axle tramp but without the drawbacks of solid mounting. The following product is suitable for the: Lexus Soarer Mk3. They improve handling whilst still giving vibration isolation at high engine speeds. - Engine Mount TOY120M. (Quantity 2) OEM Part Number(s): 12361-42050 12360-46020. 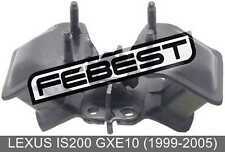 Will fit Lexus GS300 3.0-6.0L (1993-96). Interchange part no. : A4224, 2010-500540, 602-2565, 31-4224, 104-1936. Type: Engine Mounts. Style: Front. Everything included in the sale is photographed. Anything not photographed is not included. Type: Car Engine Mounts. Everything included in the sale is photographed. Anything not photographed is not included. Style: Automotive. TOYOTA KLUGER HV MHU28 2005-2008. TOYOTA HARRIER HV MHU38 2005-2012. LEXUS RX300 RX330 RX350 RX400H 2005-2008. RIGHT SIDE - ENGINE MOUNT taken from LEXUS RX 400H 2005. The following product is suitable for the: Lexus GS300 JZS147 (91-97). - Diff Mount front Bush TOY130M. (Quantity 2). These mounts fit directly to the front mounting points on the differential casing. The following product is suitable for the: Lexus GS300 JZS147 (91-97). They improve handling whilst still giving vibration isolation at high engine speeds. - Engine Mount TOY400M. (Quantity 2) OEM Part Number(s): 12360-46040. Make: Lexus. Add to Favourites. Need your item within 24 hours?. We will always try to find your sale but if we have no information it's like finding a needle in a haystack! We are happy to help you with this process. Part Number: TOY130M. It gives all the benefits of reducing axle tramp but without the drawbacks of solid mounting. The following product is suitable for the following vehicle(s): Lexus SC300 (91-00). From a Toyota Lexus Soarer SC400 SC300 Mk2 3.0 2JZ-Z20 (non-VVTi), Automatic Transmission - A340E. This doesn't include NI, ROI, offshore, the highlands or international. Based in Halifax, West Yorkshire, we will do all we can to ensure you get the OEM parts you want, at an unbeatable price. Thickness: 3mm. Type: Front. Everything included in the sale is photographed. Anything not photographed is not included. Condition: New in a plain box. Item Details Data & Sizing Other Information. Lexus SC430 Front Left Engine Mount Bracket. Lexus SC430. Used, good working condition. (Except Malta, Cyprus, Canary Islands). Part Number: TOY410M. The following product is suitable for the following vehicle(s): Lexus IS300 JCE10 (01-05). The position of all mountings is described as it would be from the drivers seat. For example, Left Hand mounts are on the Gearbox / passenger side of a Right Hand Drive car. 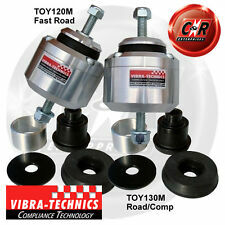 Vibra-Technics Engine Mount for Toyota Altezza, Lexus IS200, IS300 JCE10 (2001 - 2005) Models - Competition TOY412MX. The competition mounts also eliminate clearance problems with strut braces and exhaust systems, body panels etc. and improve handling whist still giving vibration isolation at high engine speeds. Part Number: FSM5331 (Ref.Only). TOP STRUT MOUNT FOR LEXUS IS. TOP STRUT MOUNT. Make: Lexus. LEXUS : 4868053030. LEXUS : 4868053040. LEXUS : 4868053050. Lexus IS220 2.2 (2005-2011) Diesel Saloon 2231cc 16Val. The competition mounts also eliminate clearance problems with strut braces and exhaust systems, body panels etc. and improve handling whist still giving vibration isolation at high engine speeds. Price is for a single mount. 2011 LEXUS IS250 AWD 64K. 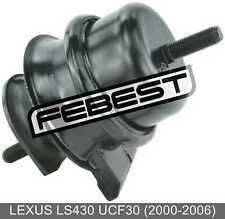 THIS ITEM FITS: LEXUSIS350 IS250 AWD 2006 2007 2008 2009 2010 2011 2012 2013. 2006 2007 2008 209 2010 2012 2011 2013 IS 250 IS250 AWD. Ask us for a quote if you're outside the US or live in HI or PR. The following product is suitable for the following vehicle(s): Lexus SC300 JZZ3 (91-00). Part Number: TOY120M. They also do not suffer from the problem of the engine sitting too high which can happen with OEM style mounts made in harder rubber. LEXUS IS200 2004. Removed From:-2004 Lexus IS200. NEAR SIDE FRONT PASSENGER SIDE FRONT. ENGINE MOUNT. Engine Code:-. GLASS AND BODY PANELS. Part Number:-. SURE TO AVOID ORDERING A WRONG PART. 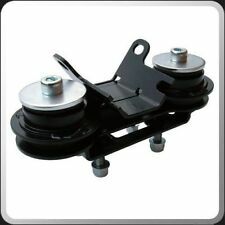 HYDRAULIC TIMING BELT TENSIONER DAMPER. 1993-94 Lexus GS300 Production Date Range: From 01-1993. 2001 Lexus IS300 Production Date Range: From 05-2000. 1997 Lexus GS300 Production Date Range: To 07-1997. Based inWest Yorkshire, Dewsbury our motto is to provide 'Service Excellence as Standard'. PART NUMBER. LEXUS IS220D PASSENGER SIDE ENGINE SUPPORT MOUNT BRACKET. REMOVED FROM A LEXUS IS220D 2.2 DIESEL 6 SPEED MANUAL SALOON. SCOTTISH HIGHLAND. MAINLAND DOES NOT INCLUDE ISLE OF MAN. CHANNEL ISLES. SCOTTISH ISLES. Part Number: FSM5274 (Ref.Only). TOP STRUT MOUNT FOR LEXUS IS. TOP STRUT MOUNT. Make: Lexus. LEXUS : 4868022150. LEXUS : 4868053010. Lexus IS200 2.0 (1999-2006) Petrol Estate 1988cc 24Val. 153Bhp IS200 2.0 Sportcross (1999-2006) RWD FR LH RH. RIGHT ENGINE MOUNT (HYDRO). LEXUS ES240/350 ACV40/GSV40 2006-2012. LEXUS ES300/330 MCV30 2001-2006. LEXUS ES300/330 MCV31 2003-2006. LEXUS ES350 GSV40 2006-2012. LEXUS RX270/350/450H AGL10/GGL10 2008-. Vibra-Technics Engine Mount for Toyota Aristo, Lexus GS300, Mk1 JZS147 (1991 - 1997) Models - Competition TOY402MX. The competition mounts also eliminate clearance problems with strut braces and exhaust systems, body panels etc. and improve handling whist still giving vibration isolation at high engine speeds. GEARBOX SUPPORT MOUNT BRACKET. MANUAL GEARBOX. LEXUS IS 220D MK2 XE20. REMOVED FROM A 2007 LEXUS IS220D MK2 XE20. UK mainland DOES NOT include. Toyota Soarer JZZ30 5/91-2/00 1JZGTE 2.5L-V6 Engine. Lexus SC300 Twin Turbo (import) 1992-00 3.0L Engine. Toyota Supra 1990-92 3.0L Engine. Price listed is for one mount only . We also provide a product warranty of 6 months from the date of sale. LEXUS GS300 3.0 V6 AUTO 2006. The Mill Walk Garage Ltd. ENGINE CODE: 3GRFSE. ANY LOCATION OUTSIDE THE UK. Arran - KA27 KA25. Oban - PH 33, PA20-49, PA60-80, KA28. Inverness - ALL. Shetland ZE1-3. The following product is suitable for the following vehicle(s): Lexus SC300 JZZ3 (91-00). Part Number: TOY122MX. They also do not suffer from the problem of the engine sitting too high which can happen with OEM style mounts made in harder rubber. The following product is suitable for the following vehicle(s): Lexus IS200 JXE10 (1G-FE). Part Number: TOY500M. They also do not suffer from the problem of the engine sitting too high which can happen with OEM style mounts made in harder rubber. LEXUS RX400H RX350. REAR ENGINE MOUNT / ROD. If you chose.